The Emergency Intelligence Incinerator in Portal. Did you just stuff that Aperture Science Thing-We-Don't-Know-What-It-Does into an Aperture Science Emergency Intelligence Incinerator? The Emergency Intelligence Incinerator is a chute that leads directly to a series of furnaces deep within the Aperture Science Facility. Incinerators appear infrequently, but appear in specific locations during both Portal and Portal 2. Incinerators play a key role during Portal and appear only twice, and also appear briefly in Portal 2 early on in the game. The purpose of the Incinerator is to safely and efficiently dispose Aperture Science technologies by providing easy access to the furnaces. In Portal, the player is forced to incinerate their Companion Cube in order to progress to the next test. During the boss battle with GLaDOS, the player must pick up Personality Cores dislodged from GLaDOS and place them in the Incinerator in order to defeat her. The Incinerator located in the Central AI Chamber in Portal. Portal 2's version of the same Incinerator, heavily worn. An early brush-based Portal Incinerator with a sliding-door design. During Portal 2, a ruined Emergency Intelligence Incinerator can be spotted inside GLaDOS' old chamber, the area in which she is reactivated. After GLaDOS is reawakened, she drops the player into the Incinerator, which affords them with the opportunity to examine the furnaces first-hand. 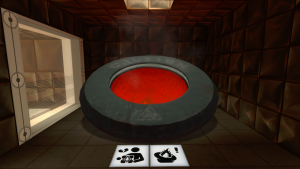 In some parts of Portal and Portal 2, an unintentional fall inside an Emergency Intelligence Incinerator will not lead you directly inside the Incinerator Room, but instead, will kill you on a pit of fire seemingly located near the entrance of the Incinerator. This page was last modified on 15 September 2018, at 18:06.